Students display research projects at the UWM Undergraduate Research Symposium on April 5 at UWM. Chuck Quirmbach reports on how the state budget could potentially help UW System research. The University of Wisconsin System could soon see an additional $150 million if a proposal from Gov. Tony Evers is approved by state lawmakers. The money is expected to be one of the topics discussed Wednesday in Oak Creek, where the Legislature's Joint Finance Committee is holding an all-day hearing on the proposed state budget. UW officials say the increase could indirectly help with a key university mission: research. 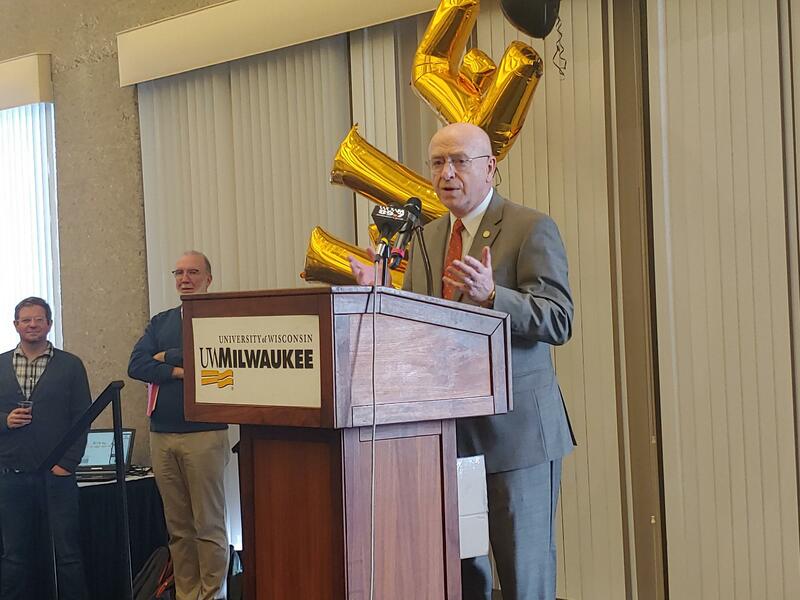 The budget discussion comes as UW-Milwaukee celebrates retaining its ranking as a so-called "R1" research university. R1 means UWM is in the "highest research activity" category, according to a national framework developed almost 50 years ago by the Carnegie Commission on Higher Education. At an event on April 5, UWM Chancellor Mark Mone said during the roughly last five decades, things have changed at the campus. 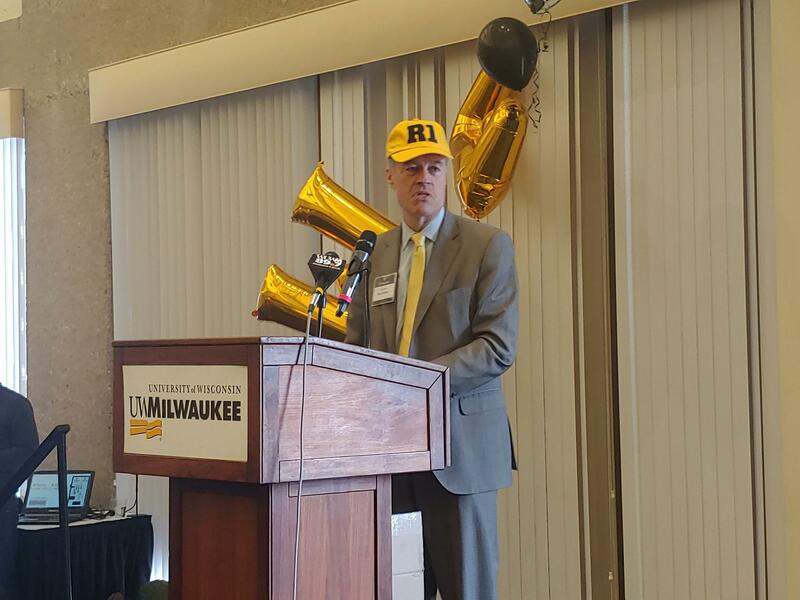 UWM Chancellor Mark Mone wears an R1 cap, as he speaks to the Undergraduate Research Symposium. "In 1965, we had one doctoral program. It was math by the way. And we had not yet granted our first Ph.D. By 2018, UWM had 36 doctoral programs and granted nearly 250 doctoral degrees each year," Mone explains. Mone says UWM now attracts about $35 million a year in research dollars, from "external sources" — mainly the federal government. UW-Madison brings in about $570 million in federal research money, and is also classified as R1. UW System President Ray Cross says the $150 million proposed in additional state funds for the system would indirectly help projects. "Very little money in the state budget goes for research. What it does though, is it facilitates the foundation for hiring faculty and other things that ultimately support the research money that comes in from the federal government or from private sources or other sources," Cross says. There have been occasional efforts at the federal level to cut spending, including for some types of research. But Cross says he's optimistic — for now. UW System President Ray Cross speaks to the Undergraduate Research Symposium. "I just came back from Washington D.C., and most legislators are speaking positively about increasing monies in the National Science Foundation or the National Institutes of Health. There seems to be a real warmth, if I can use that in the right way, toward increased research funding. But that could change at any time,” Cross warns. Wisconsin Republicans have been cool to most of Evers' state budget proposal. So, the chance that the UW System will get the additional money, and use some of it to hire more researchers, is something that won't be clear for a while. Construction is ramping up at the Foxconn site in Racine County. Spring means road projects are underway and other land preparation. And more projects are planned, including an 18-month effort to put up a high-profile manufacturing building for small video display screens. Foxconn will soon ask potential contractors to submit bids for the additional work. But can the firms trust Foxconn's request? The Milwaukee Brewers begin their regular season Thursday afternoon at Miller Park, with an opening day game against the St. Louis Cardinals. The Brewers say they've been using grow lights, but not a controversial weed-killer, to get the field at Miller Park ready for play. There are more than two acres of turf on the playing field, including what's in foul territory. As usual, the Miller Park roof was open almost all winter, and the grass did not fare very well, says the Brewers' Director of Grounds Michael Boettcher.